Beograd is where the British Embassy in Serbia is located, If you wish to apply for a visa to the UK then this embassy will be able to issue a British visa for you in Serbia. If you are a British citizen abroad then you can use this embassy for assistance with birth registration, marriage registration and also seek assistance in the event of a death or accident. They can issue you a temporary passport, renew your British passport or they can also provide you with a public notary. 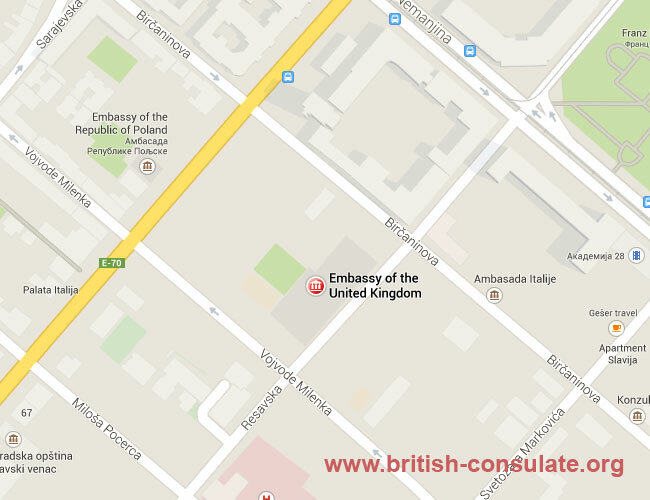 See the contact details for the embassy in Beograd for their telephone, fax, email and street address. We have also added a map to the embassy in Serbia. They are currently experiencing problems with their phone lines. Please use the information on our website and contact them by email. If your enquiry is urgent, please call the response centre in the UK on 00 44 207 008 1500.